Fast-acting Cidex Plus 28 Day Solution delivers a high level of disinfection in just 20 minutes at 25C. 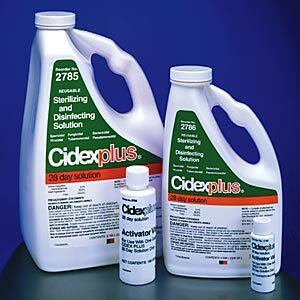 CIDEX 28-Day Solution is easily activated using the activator compound included with your quart or gallon jug. After activation, Cidex Plus provides high level disinfecting capabilities for up to 28 days. Noncorrosive to instruments. 1 Gallon. Additional shipping charges are required for all liquid gallon products. Please see the yellow section of the Shipping Table for a list of shipping options. Additional shipping charges will be added to your total at checkout.